I used to live in New York and can tell you that at any moment there are over a dozen airplanes flying around waiting to land at any of its 3 commercial airports (plus Teterboro). There's nothing all that unusual here. I've said it before and I'll say it again: If I hadn't seen a UFO with my own eyes, I'd be convinced that there's nothing to it. The video evidence is overwhelmingly weak. Magnify them, & see for your self!! PLANES! OMG! PLANES OVER NYC! GEEZ, ALERT THE AIR FORCE! I've got them on live, High-Def, streaming webcam, along with a graphic of the radar out of JFK. Very erratic flight pattern and very low and slow moving, but still look like giant lights, in the sky. 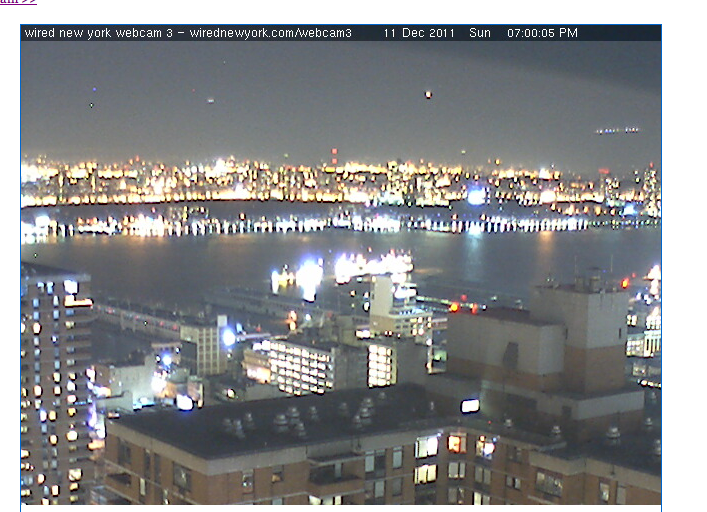 NYC is in for a show tonight, despite the webcam blackout.